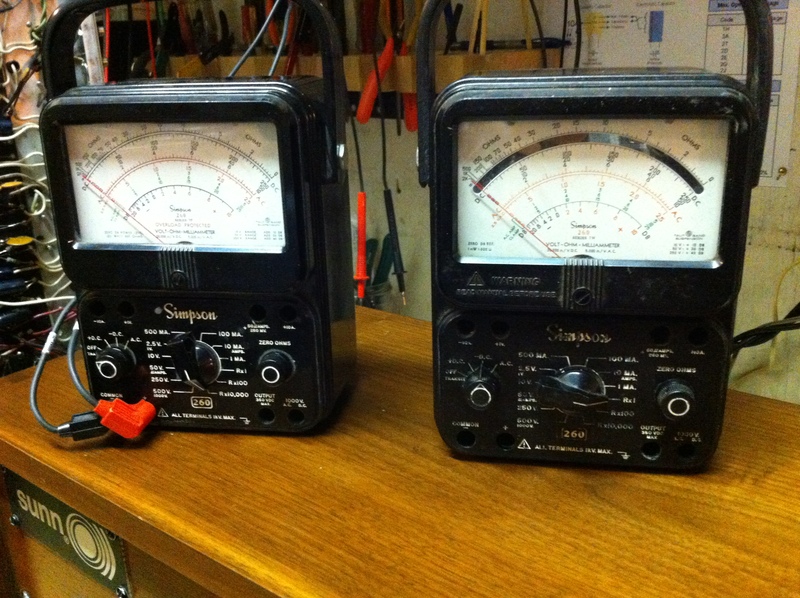 Can’t get enough vintage test equipment. I have been on a buying spree of old, old meters that may or may not work. I’ve been buying the cheapest ones on eBay. The one on the right is from eBay but actually the one on the left was given to me by me uncle and it works very nice. Both are Simpson 260 series 7 analog VOMs. The one of the left is the 7P version. The main difference I can see is that it has a push button reset switch in case of overload rather than a fuse. The meter on the right is a series 7M which has fused overload protection and the nice feature of a mirrored panel display to eliminate parallax error. Allows you to view the needle and interpret the reading on the display accurately from an angle. I am making a rough estimate but I think the Simpson 260 Series 7 was made between about 1975 and 1985. 7P on the left and 7M on the right and as you might expect they are not much different. 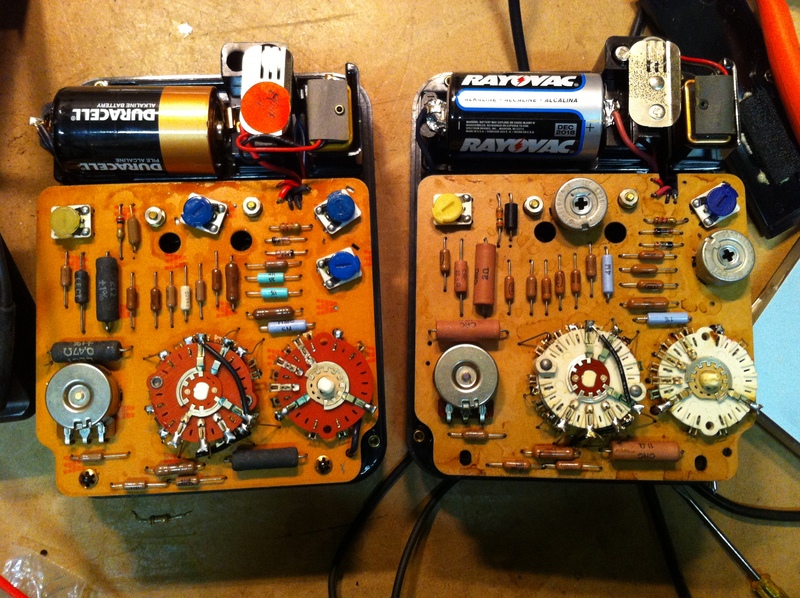 The meter on the left I received working and basically accurate, but the meter on the right needed a little work. The battery terminals were corroded. These need to make good contact with the batteries or the resistance readings will be off. You have to either clean them or hardwire the batteries. It was also out of cal. Not much of a hassle though since these meters have trimpots to adjust the calibration. 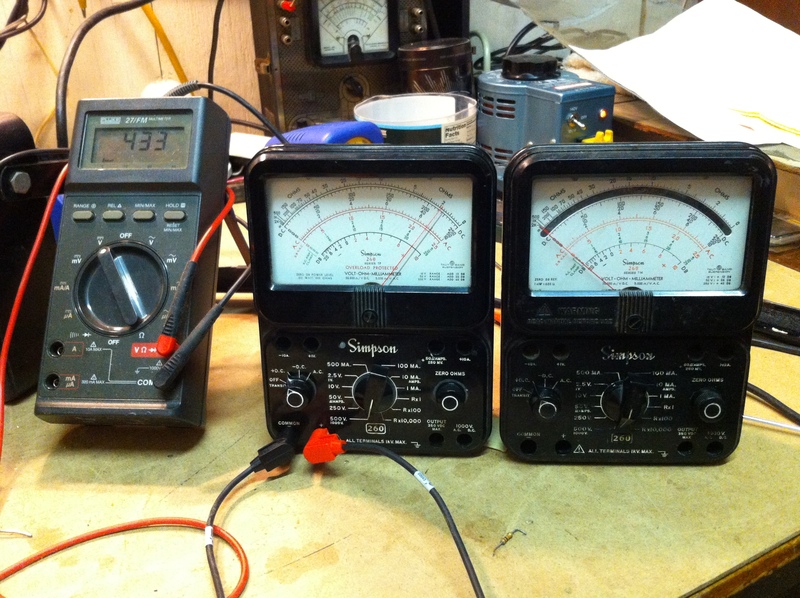 All you need is a voltage and current source and you can dial it in compared to a known calibrated meter. Ohms range uses batteries to put a voltage through the resistance under test to judge its value. A 1.5V battery for the lower resistance settings and a 9V for R x 10,000 scale. As long as the resistors in the ohms range circuit are accurate and the batteries are good, the meter will be in cal. In the image the 260 is reading 433VDC spot on nice.